Design intent documentation is critical in Experiential Graphic Design for designers to be able to communicate with fabricators who will collaborate with you to translate your ideas into physical objects. Linear - as in using the documentation process to keep moving the design process forward in a straight line. Learn design documentation strategies that effectively communicate design intent, streamline the manufacturing process, and reduce unnecessary costs to the end user and internal budget overruns. 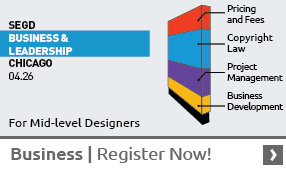 This course will touch on subjects that affect everyone on the design team: principals, project managers, designers, production specialists, fabricators, and installers. What makes a good note? What does "Performance Specification" Mean? What is the CSI format? If there’s a mistake in your design document drawings and the sign is built wrong, who’s liable if the fabricators don’t re-draw? What are designers major problems in the documentations you see? Where does the failure of communication normally occur? One Downloadable zip file containing both. Members, log in before adding products to your cart to receive member discounts using the "Log in/Register"link in the top right hand corner of this page or call 202-638-5555 for assistance.